In War, never trust anything, especially innocent-looking doves. In China in 208 AD a force commanded by Cao Cao invaded the southern region controlled by an allied group of warlords. It is time for intelligence, and that means that it is time for pigeons... more specifically doves. Zhuge Liang is the strategist of the allied side. He sends a dove on a round trip. Its mission is simple: fly to the enemy camp, make contact with the allied spy and bring back critical information about the enemy. Mission impossible? Not for this well trained dove. 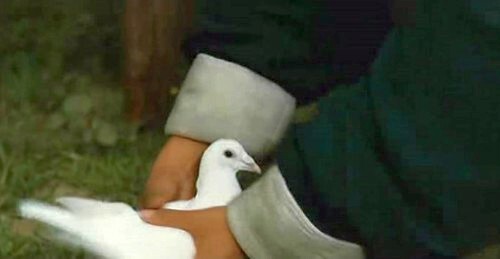 John Woo has the predilection of including doves in his movies... in this case the pigeon performance is very important. Zhuge Liang attracts the attention of the dove using birdseed. 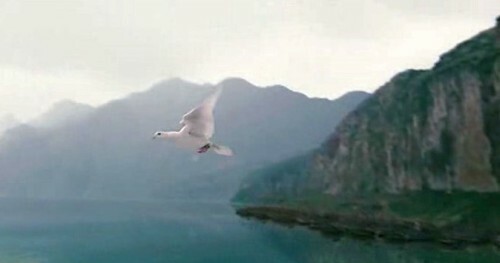 Zhuge Liang frees the dove which starts its risky mission. Commander Zhou Yu observes with attention. The pigeon finds the spy, or is it the other way around? 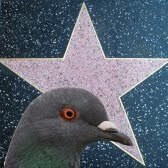 Pigeon activity: It is a messenger used for espionage. Symbolism: A dove is employed to provide an additional touch of innocence. It is critical to do an undercover operation and the harmless look of the pigeon reduces the risk of being intercepted. Relevance: Medium. The information that it carries allows the allies to discover an evil plan of the enemy forces. Training level: High. It is a well trained pigeon which is used to being in contact with humans. It is not clear if the pigeon flight was made using a computer-animated pigeon instead of a real one. All the background was rendered but I think that the pigeon probably was as well. How much was the budget of this scene.... a lot of money for sure. 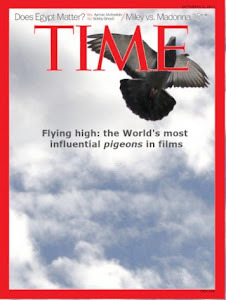 Special thank to Htcdude Commander of the Wild Empire for suggesting pigeon appearances in John Woo movies.